This tax season hits a sore spot for Ignacio Cabeza. The father of four is being audited by the IRS. "It's a lot of money to come out of your pocket," said Cabeza, who works as a sprinkler installer. He owes several thousands of dollars to the federal government. So does Miguel Medina. He's also being audited by the IRS, "[The IRS] found that I was lying basically that the person who did my taxes lied." Medina, a father of three young girls, said he owes the IRS over $7,000. Both men went to the same tax preparer, Jose Fernandez at National Tax Group Inc., now a defunct company, to have their taxes done. "It was shocking and devastating, " Cabeza said. "I trusted him because that's what he does for a living." For Medina, the IRS audit is only part of his troubles. The Miami-area resident never received his $14,000 tax refund last year. "Never got the money," he said as he described the steps he took to investigate and find out what happened. Medina compared the bank routing number on the return he signed with the one he said his tax preparer filed online. 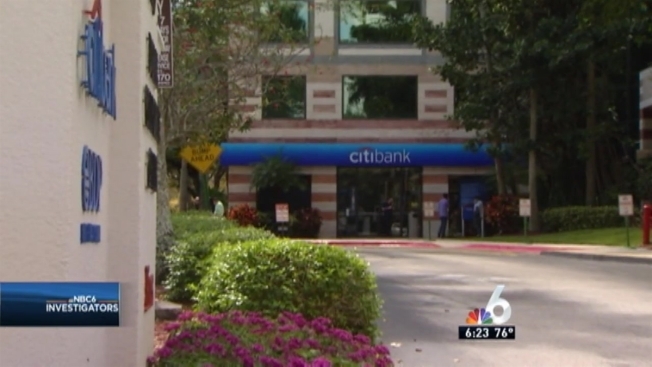 The tax return money that he was supposed to get was diverted into a Citibank account in Doral opened by his tax preparer. The IRS calls that "disreputable conduct" for any tax preparer. By phone Fernandez told the NBC 6 Investigators Medina's refund was deposited into the account to ensure he would get his fee. But he said the IRS froze the account after it detected too many refunds being deposited. Fernandez also said that Medina could go to the bank to get his money, but the bank told Medina he can't withdraw money from someone else's account. The NBC 6 Investigators made unsuccessful attempts to reach Fernandez again after finding an IRS policy that says when there are multiple refunds to one account it simply mails subsequent refunds to the address on the return. But Medina said his address on his return was also changed to a mailbox drop connected to Fernandez. In his complaint to the IRS, Medina called it theft and blamed National Tax Group Inc. and Jose Fernandez, the registered agent of the now defunct company, state records show. "It almost cost my marriage last year," Medina said. "I almost filed for bankruptcy." Medina is now one of thousands who suspect tax preparer fraud. Tax preparers don't have to be accountants or attorneys. All they need to do is register with the IRS to obtain a tax preparer identification, also known as PTIN. Even though consumers trust tax preparers with their most sensitive information such as social security numbers, date of birth address, only four states required someone to be licensed to prepare income tax returns. Florida is not one of them. In fact, it's harder to get a license in Florida to work as a nail technician than it is to do taxes. The Consumer Federation of America said in a report last year that the lack of regulation on tax preparers has led to widespread incompetence and fraud. Medina has filed complaints with the BBB, FBI and IRS. He tried to file a report with local law enforcement but was told he'd have to sue to get his money. Fernandez doesn't face any charges. The NBC 6 Investigators found that Fernandez has opened and closed four tax-related businesses in the last four years. The BBB said a company's history is important to look into when looking for a tax preparer. The experience is a tax-time lesson for all consumers. Medina and Cabeza know this too well. They learned that lesson the hard way. "You don't lie to the IRS, never in your life," Medina said. "Be careful who you do your taxes with," Cabeza said. "Don't trust nobody. Just be aware because when it hits you, it hits you hard." Rod Davis, president of the Better Business Bureau, said tax time means that consumers need to do their homework to find qualified tax preparers. "You are giving them your personal identifiable information, your bank account information so they can deposit that check into your account for you," Davis said. With no standards for education, training or competence for tax preparers, it’s taxpayer beware, Davis said. "You can try to regulate it or you can work with the current framework and really drive people to go to the individuals that do have the ethics commitment, that do have the ongoing education and who do have organizations holding them accountable." The IRS warns tax payers that illegal schemes could lead to significant penalties and possible criminal prosecution and it warns taxpayers to be on the lookout for unscrupulous tax preparers. Paid tax return preparers are required to register with the IRS and have an IRS Preparer Tax Identification Number, also known as PTIN and include it on your tax return. Ask the tax return preparer whether he/she has a professional credential such as enrolled agent, certified public accountant or attorney and if he/she belongs to a professional organization or attends continuing education classes. Check the preparer's history: Ask the BBB about the independent tax preparer businesses. For CPA's, check with the State Board of Accountancy. For attorneys, check with the Florida Bar Association and for enrolled agents, go to IRS.gov and search for "verify enrolled agent status" or click here. Ask about service fees: Avoid preparers who based fees on a percentage of their client's refund. Don't use a tax preparer that asks you to sign an incomplete or blank form. To read more about national tax professional organizations, click here. Read the full Dirty Dozen tax schemes from the IRS here.